A very basic component that all the engineers including instrumentation discipline should know about. A resistor is a passive component. It introduces resistance. Resistance is defined as the property of the material which opposes the flow of current. Since the resistors have no polarity they can be connected in the circuit in either direction. P = Specific resistance or resistivity of the material. This resistance value of a resistor depends upon physical dimensions of the resistor and resistivity of the conducting material used. Produce a desired voltage drop. Resistors are broadly classified into two types on the basis of the nature of value of resistance. 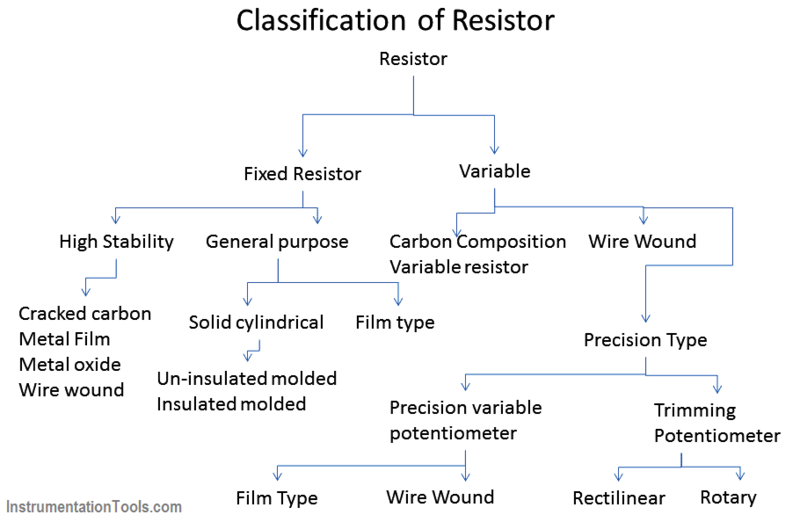 The below image is a chart on the types of resistors. Carbon composition resistors are called general fixed resistors. They are two types.